All woodhoopoes nest in a tree hole. Most cavities are natural, but old nest holes excavated by barbets and woodpeckers are also occupied, and they will rarely use a hole in the ground or a building. Where known, pairs are monogamous, and the male and adult group members courtship-feed the breeding female before egg-laying and continue to provision her and later the chicks during nesting. The female lays and incubates the clutch of two to five gray or blue-green eggs with their oval, pitted shells. She broods the young chicks after hatching, but later leaves them and joins the male or group to help deliver food. The nestlings initially retain the growing feathers within their sheaths, giving them a prickly appearance. Juveniles stay with the parents for several months after fledging, especially in gregarious species where they become helpers. The breeding biology of forest species and those in remote areas is virtually unknown. Woodhoopoes, especially chicks, have a musty odor derived from the oil of the preen gland. When combined with a hissing, head-waving, threat display and excretion of copious smelly feces, this deters predators at the nest or roost. 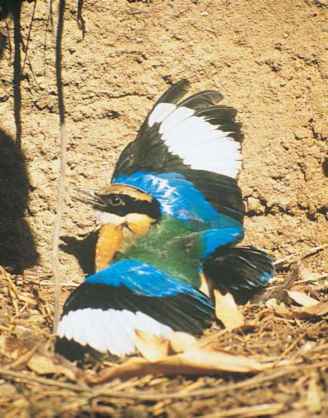 In the green woodhoopoe, the odor is the chemical product of a symbiotic Enterococcus bacterium, unique to woodhoopoes and only discovered in 2001. In addition to repelling potential predators, it also has a hygienic, antibacterial effect.